Fall is here and I’m not ready. This year as opposed to years past I’m forced to live, breathe, act differently as I struggle to discover a new normal and make it tangible. In the midst of my search life goes on and the seasons continue to change. Ready or not fall is here again, proof that the world keeps turning no matter how hard I want to go back and make things as they were. I always loved fall. The changing seasons is one of the main reasons I knew I didn’t want to continue living in Southern California. Every January however, when the skies are perpetually gray and the meteorologists feel the need to qualify the cold with harsh adjectives like bitter, raw, and icy; Chicago doesn’t seem like the place for me. But fall has always felt good to me. I like the crispness in the air. I’m a sweateraholic so I love being able to pull a sweater from my collection and put it on feeling warm and cozy but unencumbered by coats, hats and scarves. Fall felt good to me most of all because of the vibrancy of the sky and all the brilliant colors that the trees hand us as gifts. There is something about the brilliance of fall leaves that awes me every year. Walking in my neighborhood looking at the awning of brilliance only fall trees bring made me believe in miracles. It has always felt like a miracle I was allowed to watch. My daughters know how much I love the beautiful colors and since they were small would bring me leaves of varied hues and type that they collected when they were out playing. My daughters and I had already started our collection last fall. We were keeping them in a folder and I was showing them how to press leaves so that we could display them throughout our house. We took the leaves, put them between sheets of newspaper and then placed the heaviest books we could find on top of them for a few days. When we removed the books and looked at the leaves they were perfect specimens. They were dry without being crumbly and they had a resilience to them that allowed them to bend without breaking apart. We had started our collection. After October 12th, 2008 the day of Jordan’s death everything was viewed through a haze. Colors, shapes, the brilliance of fall were a backdrop for shock and pain. In the days after Jordan died Mark and I took many long walks together. The only thing we knew for sure was that we couldn’t be far from each other. Neither of us felt able to drive but staying in the house all day amidst our well- meaning families was at times overwhelming. Sometimes we needed it to be just the two of us. 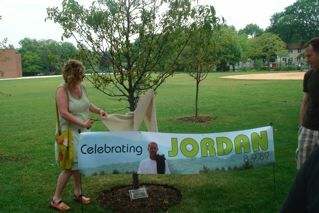 The two people who knew and felt like no one else what it was like to lose Jordan, our oldest child. We walked, sometimes in silence, sometimes talking about our beloved son, and sometimes quietly weeping. We would find a park bench sit and allow ourselves to feel the exhaustion and weariness that had taken hold of our bodies and souls. Our boy was gone. We were in shock, and numbness surrounded us. During our walks I continued my leaf collecting. Even in my haze, I felt purpose. The leaves I collected would be part of a scrapbook I would make. The leaves would sit amongst the many cards and letters we received from family and friends. So many of the cards and letters detailed special memories that were new to me of Jordan from those that knew, loved and admired him. I cherished every note that we received. I kept them to reread on those days when my worse fears surged and it felt that I was the only one who longed for Jordan and remembered him. 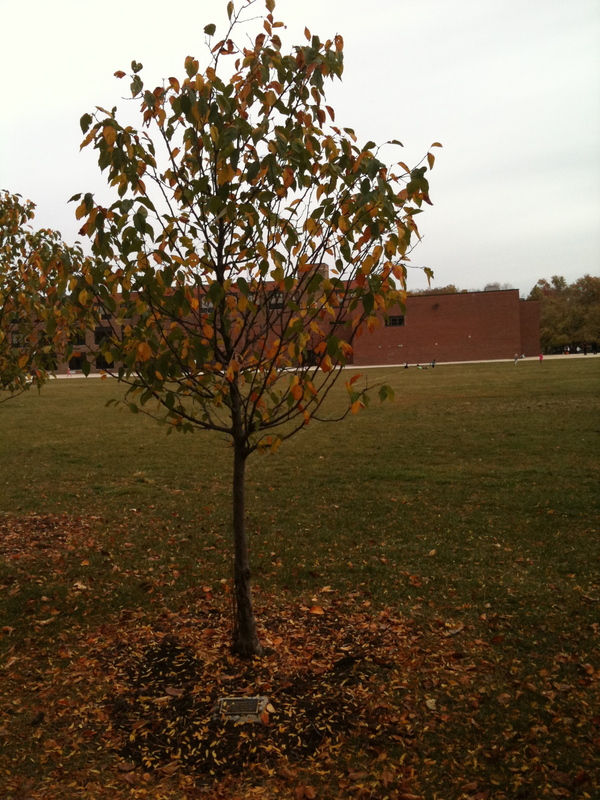 Those fall days were the backdrop for my “mother loss” pain. It seemed only fitting that the earth should say goodbye as well. The leaves were the Earth’s notes to my son. circle of green. It was my Jordan leaf. It still held green. How had I not noticed the green center when I picked it? When I got this leaf home and examined it all I could do was cry. Here was this leaf that had gone against the cycle of nature. The green center the heart of the leaf showed me what I was feeling about my child. The leaf like Jordan fell too soon. The word anniversary has become a charged word at my house. My husband and I sat on our porch last week talking about the fact that the 1-year anniversary of Jordan’s death is approaching and how we’ll prepare our children and ourselves for this day. As we sat and talked I looked up at him with a sudden memory and said, “We’re skipping September and going straight to October. It’s only September 9th. We’ve forgotten about our wedding anniversary.” We both stopped and looked at each other. Our wedding anniversary is September 17th and we had both forgotten about it. Anniversaries have different meanings now, those to celebrate, and those to endure. I’m struggling now to figure out how October 12th, the day of Jordan’s death will be spent. I say spent, not remembered or commemorated because it is a day I just want to get through. His birthday was the day we honored and celebrated his life. What do you do on the day your child died? October 12th this year is Columbus Day. All of my children have the day off from school. The fantasy I had was that I’d take the kids to school, and that Mark and I would be home and just be still and let whatever emotions were inside wash over us and spill forth. No, to be honest that scenario is my second choice. My first choice is to find a way to make 10/12 disappear. I don’t want to relive it again even though I relive it regularly. It has become more than a memory it is part of my fiber. As the day approaches my resistance to reliving this day grows fiercer. The doorbell rang before I got any further into pondering the police. I heard them ask my husband his full name. Then the officer’s voice was so low, a murmur so quiet that I couldn’t make out words. I sat up because the quiet talking was making me nervous. I started to pull on sweat pants so that I could go downstairs. Whatever they were talking about I wasn’t going to stay upstairs. Just as I was pulling on the sweatpants I heard the word “Massachusetts”. Whatever they were talking about was about Jordan. He was our Massachusetts. Nothing else in Massachusetts mattered to us. Thoughts raced through my head, first concern, “had he been hurt in an accident?” The next second it was anger, “that damn boy if he got into trouble and is in jail for something stupid he did with his friends I’m going to kill him.” All of these thoughts raced through my mind but not once did the thought of Jordan being gone ever enter my brain. That thought even now seems impossible. Not Jordan. By the time I was heading down the stairs I heard the tail end of what the officers were saying and I heard Mark scream. Scream isn’t the right word; he let out a guttural moan that I had never heard before. I reached the bottom of the stairs and saw Mark sitting on the bench in our entry with the two officers standing nearby one with his hand on Mark’s shoulder. When Mark saw me he got up to tell me what I’d already heard from the top of the stairs. I put my hand up and in a shaky voice said, “No, they have to tell me.” I stood on the rug under the light in our entry and I looked up into their faces daring them to say it again. I already had my arguments ready to show them they were wrong and they didn’t know for sure. I let them talk. I knew it was true when the officer said Jordan had identification on him. Jordan always had his wallet with him. He always had his wallet, Ipod and phone wherever he went. I couldn’t make what they said untrue. I was out of questions and out of stalling tactics. I had to let the news in-Jordan is gone. Somehow Mark was standing beside me. I looked at him as he cried. He told me the other boys were pretty banged up (I later found this to be untrue. All three of Jordan’s friends walked away from the accident) but that Jordan didn’t make it. Then we cried together. We held each other and cried even though all my brain was saying was NOT JORDAN. NOT JORDAN. Our cries and moans woke our other children and in less than 10 minutes we were telling my son and daughters what happened to their brother. We all stood huddled together crying and comforting. My 16 yr. old son like me tried one last time to make the news untrue. “ He’s just hurt right, he’s not gone.” I had to tell him again, “No baby he died in the accident. He’s gone.” All we could do was cry. 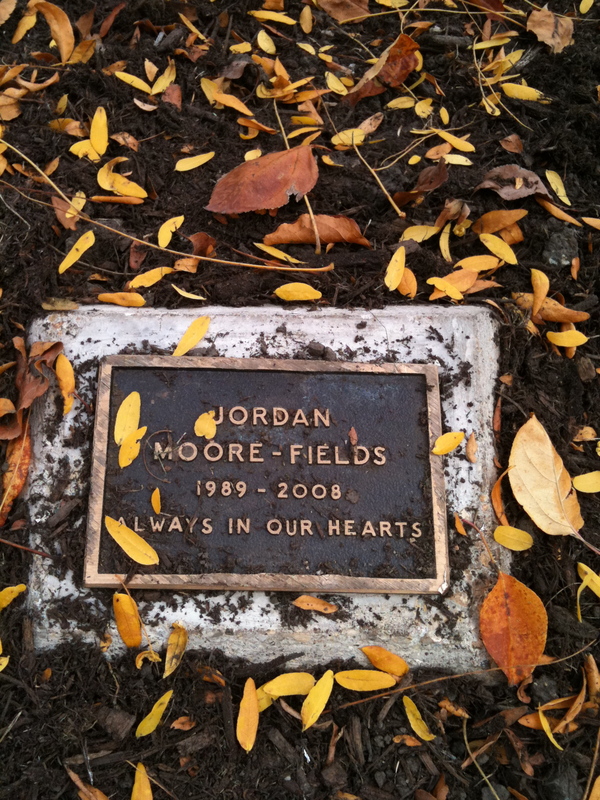 October 12th, 2008 the day Jordan died. Now the anniversary of that day approaches and my mind won’t release me from that night. The day is coming no matter what I do. My husband and I are thinking, praying and consulting with others about how we’ll get through this day for our children and ourselves. I know that we’ll talk as a family about what we’re feeling and not hold anything inside. No matter how much I wish I could shield my children from the pain of this day I know I can’t. They will feel their pain and look to their parents for comfort, and we will absorb as much of their pain as we can. Right now it hurts as much as it did then. Not Jordan. Even as a year without him approaches I still say Not Jordan.